the first definitive non-zero measurement of the neutrino mixing parameter theta-13, and today’s news that the ICARUS experiment, in the same underground lab as OPERA, has measured the speed of neutrinos and found it to be consistent with the speed of light (as many would say, “Too soon to claim an error, but who would bet against Einstein at 3 x 10^8 m/s?”). 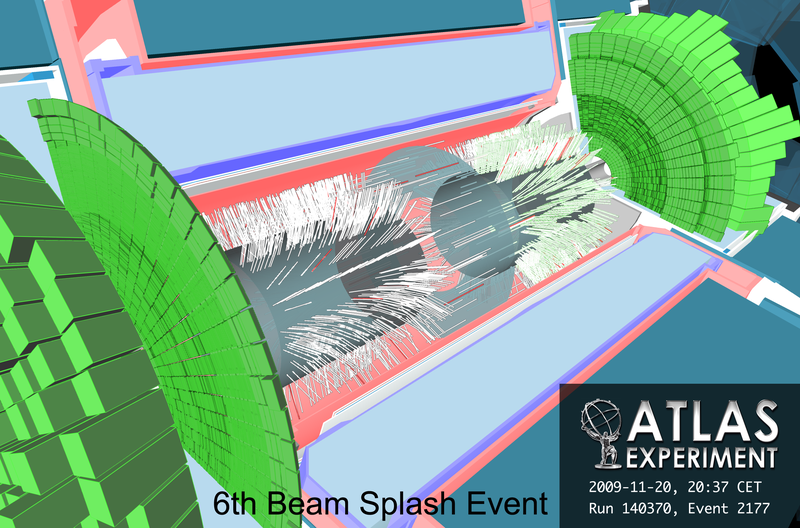 Meanwhile, the first beams of the year are now circulating in the LHC, and we are anticipating a very exciting year. However, I have come here today to discuss something much more boring, which is money. (Sorry about that, but my job here is to write about life in particle physics; this is a piece of it.) All of the great science that the LHC is bringing to you doesn’t come for free, of course — in fact, it is funded by you, the taxpayer. In the United States, research in particle physics is supported predominantly by the Department of Energy and the National Science Foundation, who are also the sponsors of the US LHC blog that you are reading right now. Much of the funding goes into grants to research groups at individual universities, which in turn goes to support the hardworking graduate students and postdoctoral researchers who are running the experiment and analyzing the data, and who will be the future leaders of science and technology in our country. But a lot of it goes into behind the scenes stuff — helping to pay our share for the operations of the experiments, funds for research and development and purchasing equipment for detector upgrades, and the deployment and operation of the computing resources needed to analyze the data that comes out. This is referred to as the “operations program”, and for US CMS, this comes to about $38M/year — not much at all in the grand scheme of the entire multi-trillion dollar federal budget, but a noticeable bit of the budget for particle physics in the US. I’m the deputy leader of US CMS software and computing, so it is part of my job to make sure that the program is executed well. It is only proper that there is some oversight and review of the operations program. The program managers interact regularly with our contacts at the funding agencies, and with all of the US CMS physicists who depend on and benefit from the program. But we also have an annual formal external review. This year’s review was held last week at sunny SLAC National Accelerator Laboratory. While the review is coordinated by program officers at the funding agencies, it is conducted by our peers — experienced particle physicists (and a few physicists from other fields) who have had to run similar programs themselves. They know the hard questions to ask that will probe whether we are really providing value to researchers and whether the science we are doing is truly worth the investment. Getting their outside perspective is very useful for us, as it helps us evaluate our own work from a different angle. If I may say so, these reviews are pretty intense. We start getting ready for them a couple of months in advance, as we pull together documentation that demonstrates our achievements of the past year, and how we have implemented recommendations from previous reviews. We are often given specific questions about how we would allocate resources for the future. We also rehearse the presentations that we are going to give for our collaborators, who help us make sure that what we say is going to make sense to outsiders. The review itself starts with a series of presentations from us about what we are doing. Then the review panel breaks into subcommittees that focus on different aspects of the program, and we address some issues in more details. At the end of the working day, the panel gets back together and poses a set of questions for us to respond to about topics that they thought needed more consideration. After a nice dinner where we try not to think of the task ahead of us, the US CMS team reconvenes to come up with written answers to the questions. This year I stayed up until 1 AM to finish my part, while other colleagues were up later. Then we all got back together at 6 AM to check things over in advance of our presentation to the panel at 8 AM. Whew! Then the panel takes a few more hours to synthesize what they learned from us, and to present a closeout report. I’m happy to say that US CMS came out quite well this year. We were praised for our contributions to the fabulous results that came out of the LHC in the past year, and for how we are supporting our colleagues in pursuing the science. It’s always a relief to get through this, but also to know that we are doing right by our collaborators and by you, the people who are generously making our work possible. Primary and Secondary education: For simplification, let’s say I spent all of my k-12 years in Colorado. Colorado ranks roughly 42nd in per-pupil spending, but it still costs $8,600/pupil/year for k-12 education. Therefore, my high school diploma cost roughly $112,000. Bachelor’s degree: I went to Colorado State University for my undergraduate degree – a large state university. Colorado State was a great bargain and when I started there, in-state tuition was roughly $2000/year. Most of this was covered by scholarships, so was actually paid by some branch of government. However, CSU spent roughly $20,000/student on undergraduates, with the difference made up from the general fund. I spent five years in undergrad, so just the tuition for my degree was worth roughly $100,000. Fort Collins, CO was pretty cheap to live and I was an overwhelming cheapskate. My cost of living averaged about $10,000/year, adding another roughly $50,000. Additionally, I participated in four summer undergraduate research programs. One program was at CSU and my participation (salary and other expenses, excluding the salaries of my supervisors) cost roughly $4000. One program was at UNC Chapel Hill and I got paid $3,000 plus room and board and transportation to Chapel Hill, so this cost roughly $5,000. One program was in the Netherlands for five months and this probably cost roughly $10,000. One program was in Switzerland for two and a half months and this probably cost roughly $10,000. So the cost of my supplementary training as an undergraduate was roughly $29,000. Therefore the total cost of my undergraduate degree was roughly $179,000. Doctorate: The average time in graduate school in physics in the United States is six years. I spent six years and two months in grad school. Grad students in physics don’t pay for their tuition, but tuition is paid to the university by the grant. At Yale, my tuition was about $20,000/year. In addition, my stipend, my supplementary salary from teaching, the cost of my health insurance, and overhead added up to at least $40,000/year. This adds up to at least $360,000. On top of that, I took trips to conferences and to take shifts. My travel for my research definitely pushed the cost of my graduate degree to at least $400,000. Therefore my PhD cost roughly $691,000. This is not a precise calculation and one could certainly quibble with details. I’m sure that people with more knowledge about grants would say I’m actually underestimating a lot of costs. A PhD at Yale is probably more expensive than at other schools, but it still easily costs well over half a million dollars to produce a PhD. That’s a huge investment for society to make in a person – and I’m very grateful. I benefited significantly from scholarships and grants. Other than paying taxes like everyone else, my family and I probably paid less than 5% of that cost. Some costs were picked up by private organizations through grants, awards, and scholarships, but most of it was paid for by some branch of the government. My teaching, tutoring, and research does have economic value – I don’t see myself as a leech on society – but I do owe my education and the opportunities I’ve had to the kindness of taxpayers. If we did not live in a society that at least strives to create equal opportunities for all, I would not be where I am. Because of the debt I owe society, I feel it is my responsibility to give back – to use my education to explain what I do to the public and to help inspire and train the next generation. At the same time, society benefits from having highly educated people. I am doing basic research that will most likely not lead to a marketable product in my lifetime. But basic research is crucial to future economic developments. Research in high energy particle and nuclear physics has led to cheaper and better particle detectors which can be used for medical technologies. CERN played a crucial role in the development of the internet – certainly more than Al Gore – and it still does. All of the experiments at the LHC use a computing infrastructure called the grid and developing the grid took substantial improvements in networking and distributed computing. Studying the Quark Gluon Plasma will not directly feed the hungry or cure cancer, but we move the boundary of what is possible and this benefits humanity. It is true that recent concerns about the sovereign debt in Greece is leading to uncertainties in financial markets that could hold back economic recovery around the world, which is hardly good. But one side effect has been the strengthening of the dollar against European currencies such as the Swiss franc (CHF), and that is good news for US people working at CERN. What we don’t know, of course, is which way that graph is headed, and that makes it hard to plan and budget and so forth, especially on the timescale of years. More to the point, should I get cash out of the CERN ATM today, or wait until tomorrow? This Thanksgiving particle physicists have a lot to be thankful for, not the least of which have been the exciting progress with collisions at the LHC. Happy ATLAS Scientists, Image from the ATLAS press release. The key to meeting these challenges — to improving our health and well-being, to harnessing clean energy, to protecting our security, and succeeding in the global economy — will be reaffirming and strengthening America’s role as the world’s engine of scientific discovery and technological innovation. And that leadership tomorrow depends on how we educate our students today, especially in those fields that hold the promise of producing future innovations and innovators. And that’s why education in math and science is so important. The Educate to Innovate Campaign draws from the private and public sectors to find ways to promote science to kids. As someone who grew up watching Bill Nye the Science Guy, I was very pleased to see that many of these plans involve tying in science programming on television shows. Further, it was good to hear the president reaffirm the goal that we need to transform the culture of education in this country. He remarked that during his recent trip to Asia, he was impressed by the “hunger for knowledge” and “insistence on excellence” that formed the foundation of each students’ education. Speaking of Asia, I would be remiss if I didn’t share another understated physics news item from this past week: the Institute for Physics and Mathematics of the Universe (IPMU) is in danger of funding cuts from the newly elected Japanese government. For those that are not familiar, the IPMU was recently established to be a high-profile international center for research on the interface of physics and mathematics. It has great potential to act as a focus for theoretical physics in Japan that can connect physicists and mathematicians from all over the world. As reported by Sean at Cosmic Variance, funding cuts are looming ominously for IPMU and the Japanese Ministry of Education and Science is looking for input from scientists around the world. More information is available in an IPMU press release. Earlier this year the Science and Technology Facilities Council of the United Kingdom provided a renewed funding grant to the Institute for Particle Physics Phenomenology (IPPP) at Durham University, where I was fortunate to have been able to spend a year as a student. Hopefully IPMU will also be able to continue onwards even during tight economic times. I know this is the US LHC blog, but the fact of the matter is that particle physics is very much an international effort. CERN itself was, in some sense, a precursor to the European Union and today scientists from around the world contribute to the forefront of particle physics research. Researchers at American universities hail from all over the world and academia flourishes in this environment of diverse backgrounds. And you know what? That’s part of what makes this line of work so much fun. Happy Thanksgiving everyone! Most graduate students I know are paid enough to live fine in France. I do occasionally, however, hear about a grad student who isn’t being paid nearly enough and is digging into savings just to get by. That is why it is important to know how much it will cost for you to live somewhere before you agree to move there. If a professor (or boss) isn’t offering you enough compensation to move you should make them aware of this and negotiate a higher pay. Will work for travel money !! I was out of commission for a few weeks, mostly on vacation, mostly in Germany. And when I came back to the U.S. the price of gas had risen another 50 cents and is now hovering around $4.25 a gallon. Most of my European friends are not very sympathetic because if you use 1.5 as an exchange rate for Euro to Dollars the price per gallon in Germany is now around $9, so almost exactly double the U.S. cost. Still, that’s not the point, because small distances in the U.S. are huge distances in Europe (I can get as fast from Frankfurt to Geneva as I can from Detroit to Chicago, which is probably the shortest distance between two major cities in the U.S.). So at some point one might ask, what will be the impact on doing research abroad ? Well, travel cost will go up drastically. You’re already paying extra for drinks and luggage on some overseas flights, but the major cost hikes will come from gas prices. The transportation problem in the U.S. is becoming so bad that people already are contemplating the effect on the higher education system. The New York Times featured an article on July 11th that shows that students more and more sign up for online classes, and many of them state the cost of driving to and from school as one of the major motivators. On-Campus education could, at some point, become prohibitively expensive, not because of college tuition but because of additional transportation cost. So the question might arise whether in a time of world-wide science globalization, on-site science might become prohibitively expensive and everything besides maintenance needs to be, and will be, done remotely via GRIDs, EVO, etc.. Still, the on-site shift load that I reported on last month seemed daunting and that is just the minimum commitment to keep the experiments afloat. So both the U.S. groups as well as the U.S. funding agencies need to seriously consider the effect an economy in crisis, and therefore a potentially staggering increase in transportation cost to and from the experiments, might have on our future plans. Another sign of the apocalypse: It was the week of the Open House for prospective graduate students at MIT, and I met about a dozen of the best and brightest undergraduates interested in Experimental Particle Physics. At this time when there is a peak in interest in the LHC, we are hitting a nadir in funding necessary to bring the new students on board and I had to tell them that were in not for the funding situation I would be happy to bring them into the group, but because of funding I have to turn the majority of them away. I hope they find a spot in another top notch institution and become my collaborators anyway, but am not confident that given the overall situation in Fundamental Research at the frontiers of knowledge that all institutions are not in the same boat, more or less. At a recent meeting of the MIT faculty of the School of Science, MIT President Hockfield (who is working hard to make things better in this direction on our behalf, which I appreciate greatly) opened the discussion with “I don’t need to tell you why we need to increase Graduate Fellowships” which tells me that this problem is endemic. She did her part, did you do yours? I’m so proud. I told you my Mom was on the job. She’s waiting to hear back from her representatives. By the way, the proposed budget for 2009 just put out looks better (but we’ve been down this road before).